Historically, when a child is diagnosed with a disability, it is a diagnosis for life. Though they will grow and learn, the disability will impact them forever. People dont recover from cerebral palsy, Down Syndrome, or blindness. According to this book, some do recover from autism spectrum disorders (ASD), attention deficit disorders, learning disabilities, and pervasive developmental delays. They often recover through a method called Auditory Integration Training (AIT), based on the concept that some of these kids suffer from hypersensitive hearing-they cannot filter or modulate incoming sounds and so they experience life as an assault of noise. They react with inappropriate behavior, and are often diagnosed, like the editors daughter, as functionally retarded. These personal stories, told mostly by the childrens parents, follow a common pattern: an anti-social child with extreme behavioral issues responds minimally to conventional treatment, such as speech and occupational therapy. Then, after a ten-day AIT program, the child is profoundly changed. Some kids completely recover from autism and live typical lives. Others need help from other therapies to catch up for their lost years of development. AIT was developed by Guy Brard, a retired otolarnygoloist from France. In 1977, he cured Stehlis daughter, Georgiana Thomas, catapulting Stehli into her lifes work. Exempt from scrutiny by the FDA and occasionally covered by health insurance, AIT is available because of Stehlis dedication to making it available. The training consists basically of the child listening to a specially modulated music tape twice a day to re-teach the brain how to process sounds. 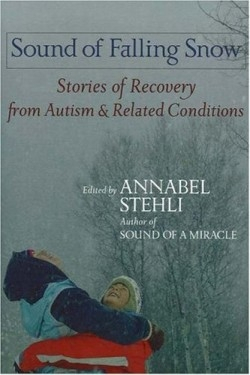 Stehli has written several previous books about raising children with special needs, including The Sound of a Miracle: A Childs Triumph Over Autism. In this new collection, she has a light editing touch, and the stories read like conversations rather than polished pieces. James, whose mother wrote about him in Stehlis Dancing in the Rain: Stories of Exceptional Progress by Parents of Children with Special Needs, writes his own version of how his life changed after AIT. He feels that his autism is a gift, as it gives him a different way of seeing and being in the world. Other stories introduce other alternative forms of treatment such as Nicholass special diet or Brians success with Applied Behavior Analysis. Whenever there is a new treatment that works for some but not all kids, critics are quick to dismiss it. Stehli does not claim that AIT is a panacea for all kids on the autism spectrum, but she does fervently believe that it works for kids with hyper-acute hearing. As an anecdotal presentation, rather than medical fact, this book changes the way disabilities are defined and treated. It offers hope to all those living with differences.